Installing an ELECTRIC TANK-LESS often requires larger Copper electrical lines than you may have installed to your existing Water Heater. You may need to Install 50 or 60 Amp lines. Finding a excellent electrical contractor experienced to do these installations can be a stressful endeavor. I can find you a company that I can wholeheartedly recommend for the electrical portion of your new electric TANKLESS installation. We are installing quite a few of these Tank-less units in ELECTRIC.There are several models and makes. If you have an Electrical panel that will accept the additional load, a Tankless WATER HEATER like the one below can be installed and save you space and money. A Tank-Less system will give you years of service operating only when you turn on a fixture. Please call 386-738-9001 much more info is available and all your questions will be answered about tank-less. 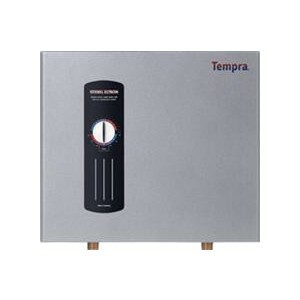 This unit is designed to work in cold areas where smaller units will not work.